Today was a grand one, and one that went according to plan – a boon on a long and ambitious cruise that aims to penetrate the Central Aegean from its eastern edge. 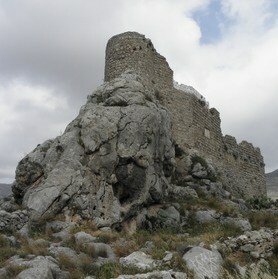 We left Bodrum, and thus Turkey, and entered Greece by arriving at Kalymnos in the Dodecanese. This is an island we know very well, as it is not only part of this ongoing Cruising to the Cyclades trip, but also of Cruising the Dodecanese, of our ever-popular Cruising the Aegean: from Kos to Patmos, of our Family Cruise in the Dodecanese and – as of 2018 – of our Walking and Cruising the Dodecanese. 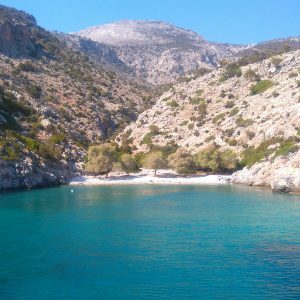 We include Kalymnos in so many of our trips because we are very impressed with the island and its archaeological and cultural heritage, and also – frankly – because we are very fond of it. Today, we spent the whole afternoon in Pothia, the main town and harbour of Kalymnos, a very interesting, lively and authentic Greek island town, and – exceptionally perhaps – one that is not quite dominated by tourism. Pothia is a superb sight, second only to Symi, arranged in a theatrical manner around its deep bay, with tiers upon tiers of traditional houses in various variegations of Neoclassical, from modest to elaborate, and arranged chronologically from the earliest buildings on the slopes to the most elaborate on the seafront. Pothia’s traditional architecture, capturing 200 years or so of urban and cultural development in stone and clay, is a reflection of the town’s past wealth, which hinged on its pivotal role in the sponge-diving tradition of the Aegean. Today, it is home to the last remaining sponge-diving fleet, a dozen boats or so, and high-quality sponges are still a factor in the town’s and the island’s economy. 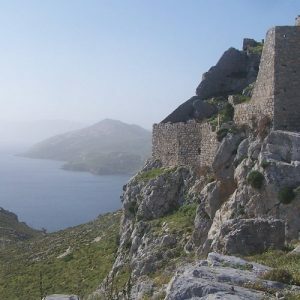 We were not able to show our guests the more bucolic side of Kalymnos today, but we did present its surprising cultural wealth and especially its archaeological museum, which is a hidden gem and an enormous asset to a small island, home to a world-class collection of Ancient Greek sculpture, and especially to one of the finest of all surviving Ancient Greek bronze statues, the Lady of Kalymnos, found on the sea-bottom between Kalymnos and Pserimos and part of a larger story of discovery that is still developing. 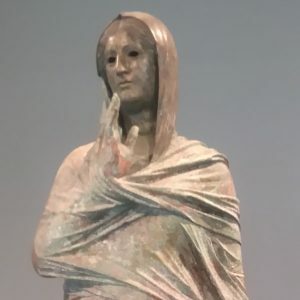 Considering how Kalymnos has lately gained fame and attention for a recently-discovered ancient bronze sculpture, it is a striking coincidence that bronze statues have been an emblem of Pothia for decades already. The seafront is decorated with a large series of bronze statues from the mid-to-late 20th century, most of them by local sculptor Michail Kokkinos. My image shows our gulet, the “Aegean Clipper”, next to a bronze diver.